CoolSculpting® Denver Colorado | Buy 3 and the 4th is Free! CoolSculpting is a non-invasive procedure that targets and freezes stubborn fat. Dubbed the ‘liposuction alternative’ by celebrities, CoolSculpting can remove up to 20-25% of fat cells that are resistant to diet and exercise. 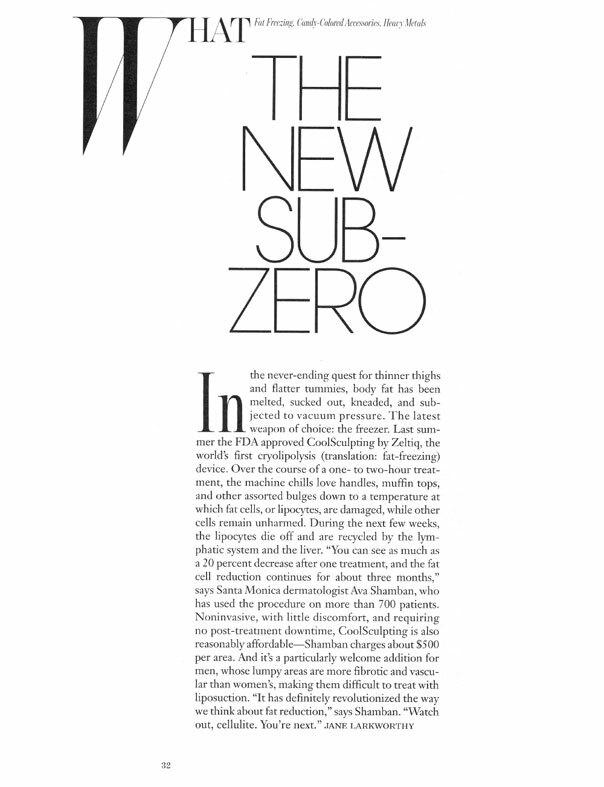 CoolSculpting is non-surgical, safe and FDA-approved. CoolSculpting at our Denver Colorado practice selectively freezes fat cells in targeted areas of the body. Frozen fat cells die and are gradually eliminated by the body’s lymphatic system. This is achieved without surgery, downtime or damage to the skin. The procedure works consistently for both women and men of all skin types and ethnicities. CoolSculpting has recently become a favorite among celebrities, including Khloé Kardashian. There’s no doubt Khloé has recently transformed her look. Khloé recently spoke about her CoolSculpting in a interview with New Beauty Magazine. 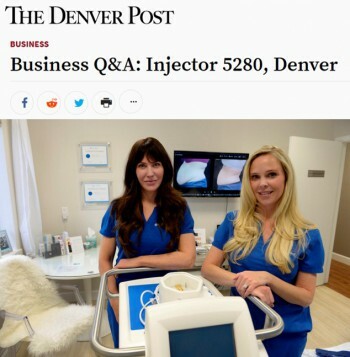 Injector 5280 is a leading Denver CoolSculpting practice. 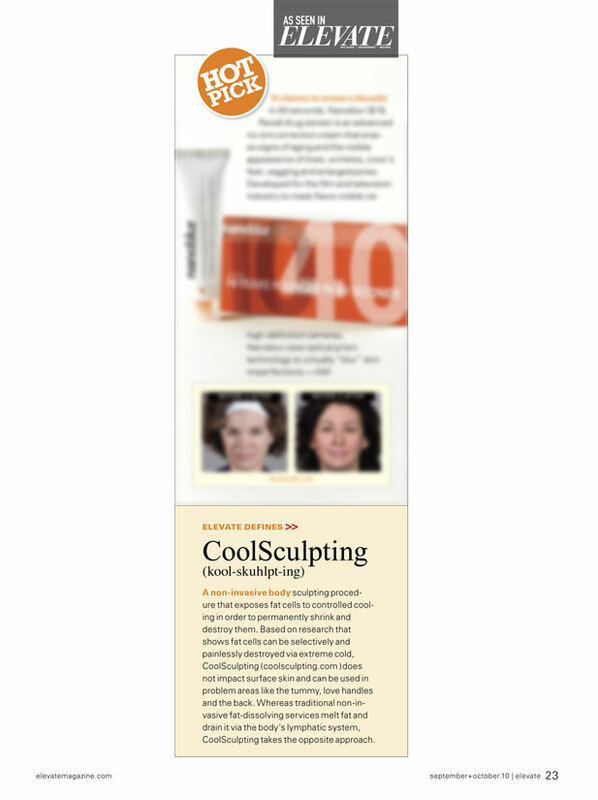 We are specialists in CoolSculpting – and have been proudly featured in The Denver Post. As you will see from the Video Testimonials and Before and After Photos (of our own patients), CoolSculpting is both an art and a science. CoolSculpting is not a ‘one-solution-fits-all’ treatment. Everyone’s body is different and needs to be assessed accordingly. Our practitioners have undergone rigorous training and perform advanced CoolSculpting techniques. Our practice offers the newest CoolSculpting machines with CoolAdvantage applicators, the most up-to-date applicators available. Even though the procedure is non-surgical, we believe CoolSculpting is a technique driven treatment. Attention to detail, passion for perfection and our understanding of anatomical balance sets us apart from other providers. April and Kellie are directly involved in each CoolSculpting treatment. We do not pass off your CoolSculpting treatment to an employee to perform. Our aesthetic eye, attention to detail and passion for perfection sets us apart from other providers. CoolSculpting at our Denver practice is safe, predictable and affordable. We have many years of plastic surgery, medical imaging and CoolSculpting experience. We know how to achieve your most desirable outcome and we truly care about your end result. Our experience ensures you’ll receive the most effective treatment plan, with the correct applicator and optimal placement. You can be assured you will receive a customized treatment plan, quality patient experience and importantly, follow up. We also offer 15 month interest free financing. Our medical office is certified by Zeltiq Aesthetics, the manufacturer of CoolSculpting. Which Areas can CoolSculpting be Administered? Small Areas of Fat – including knee fat, axillary fat under the front of the arms (front bra fat) and other pockets of fat – if you can pinch it – we can freeze it! 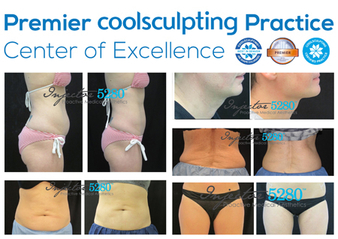 How is CoolSculpting Administered at our Practice? The treatment begins with collectively reviewing your personalized treatment plan, reviewing post-care instructions and answering all of your questions. After you are sitting comfortably, our certified practitioners will carefully and strategically position the CoolAdvantage applicator on the treatment area. Using gentle suction, the targeted tissue is drawn up between two cooling panels. During the first few minutes as the cooling begins, you will feel pressure, tingling and cold. This will soon subside as the area gets numb. CoolSculpting is non-invasive – therefore no downtime is required. You can return to your daily activities immediately, including going back to work and working out. CoolSculpting side effects are generally very rare and minor. They can include temporary discomfort, tingling, numbness, bruising or redness in the treated areas. These symptoms are temporary and will resolve themselves over the first few weeks. Read more about CoolSculpting Side Effects. Each CoolSculpting treatment reduces the fat layer in the target area. Some patients reach their desired outcome after just one treatment, while others may need multiple treatments. Your personalized treatment plan will be specifically customized for you. Treating adjoining body areas often leads to higher patient satisfaction rates. Do I Need to Lose Weight Before CoolSculpting? Ideal patients do not have to be at their ideal body weight, however they should be within 40lbs. Patients are typically frustrated with stubborn fat in particular areas of their body. Most patients wish to target bulging fatty areas that have always been resistant to diet and exercise. After treatment, many of our patients have been so pleased with the results, the treatment becomes a catalyst to jump start further weight loss. Schedule a complimentary consultation with us to determine if you are a candidate. Watch Video Testimonals of (our own patients). See Before and After Pictures of (our own patients). We are a Premier Certified CoolSculpting Practice, offering affordable and cost effective treatments with an upfront pricing policy. Buy 3 Cycles – and the 4th Cycle is FREE! .. OR.. Buy 5 Cycles and Save $1000.00!